Two ambitious individuals from West Bend have upgraded from playing high school sports to directing big time collegiate athletics. Both Craig Pintens and Mike Houck are highly respected officials at their respective universities. Pintens, a 1994 West High School graduate, is now at the University of Oregon and is the Senior Associate Athletic Director. Houck, a 1990 West graduate, is at the University of Oklahoma and serves as the Assistant Athletics Director/Strategic Communications. Houck is the older of the two gentlemen and has traveled a unique road to where he currently works in Norman, Oklahoma. 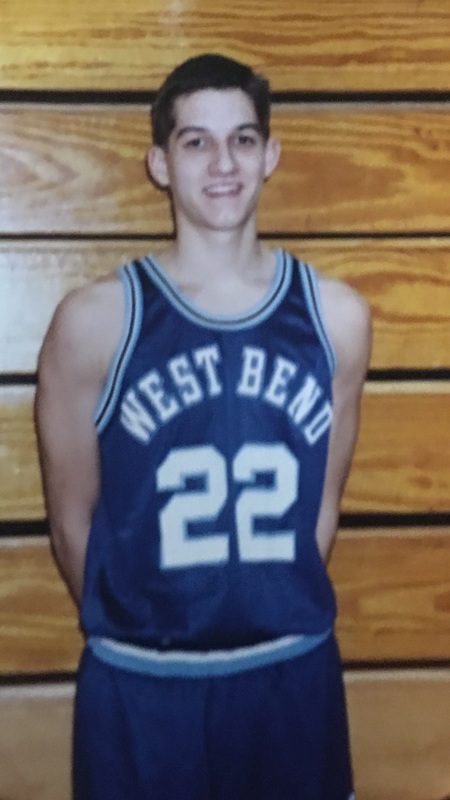 During his time as a student-athlete at West High, Houck played baseball and basketball all four years and played golf his freshman and sophomore seasons. He served as a basketball co-captain his senior year. When asked about his favorite class in high school, Houck hesitated. 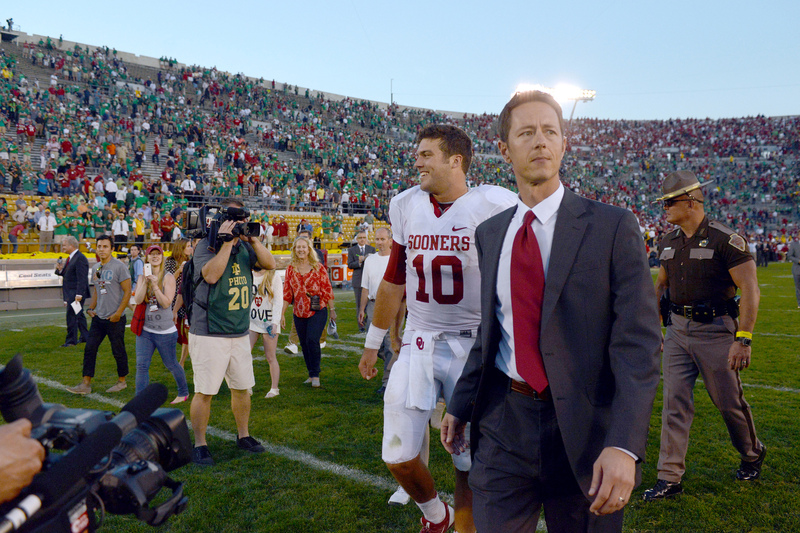 Mike Houck escorts quarterback Blake Bell to a press interview after Oklahoma defeated Notre Dame in 2013. Photograph by LaizurePhoto. After high school, Houck attended the University of Wisconsin-Madison where he focused on classes, intramurals and having fun in college. He also majored in journalism. Houck started working at the University of Oklahoma in the summer of 1995. “I started as an intern in August, one week before the first football game of the season,” he said. From an early age, Houck knew OU was the right fit for him. Over the last two decades, Houck has been fortunate to work alongside some of the greatest athletes and coaches in the NCAA. Mike Houck with Blake Griffin, the 2009 National Player of the Year. Photograph courtesy of Houck. Recently, Houck was on a business trip as the Sooners took on the Auburn Tigers in the Sugar Bowl. Oklahoma football is one of the nation’s most decorated football programs. “The last two seasons with football, I’ve worked closely with receiver Sterling Shepard (now with New York Giants), quarterback Baker Mayfield (finished third in Heisman Trophy voting this year), receiver Dede Westbrook (finished fourth in Heisman voting this year) and running back Samaje Perine (OU career rushing leader),” Houck said. Houck has also worked with recent NFL standouts. The University of Oklahoma has a special place in Houck’s heart. There is a comfort level for Houck and his family. Unlike Houck, who made his way south, Craig Pintens ended up on the West Coast in Oregon. Pintens in high school. Photograph courtesy of the Pintens family. Pintens graduated in 1994 from West where he played baseball, basketball and participated in forensics for the Spartans. “Although my athletic career was of little distinction, I was a two-time national qualifier in forensics,” Pintens said. Pintens received his college degree from the University of Wisconsin-Whitewater with a major in marketing and continued his education with a degree from Marquette Law. “In college I participated in intramurals and was President of the Honors Student Association,” he said. 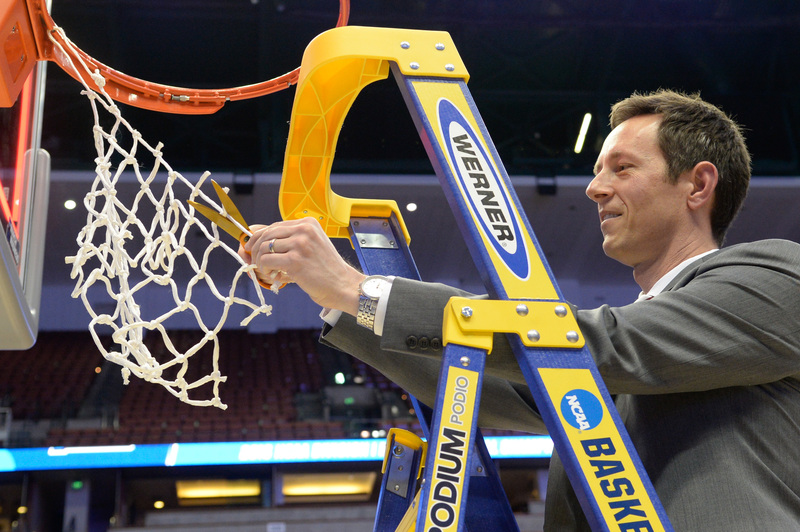 A decade later, Pintens accepted a job offer from the University of Oregon. Pintens worked at LSU from 2009-2011. Similar to Houck, Pintens has worked with outstanding student-athletes and seen incredible success at Oregon. “Since 2010 we have won more national championships than any school in Division I (15),” Pintens said. Craig Pintens with Willie Taggart, Oregon’s new head football coach. Photograph by Eric Evans. 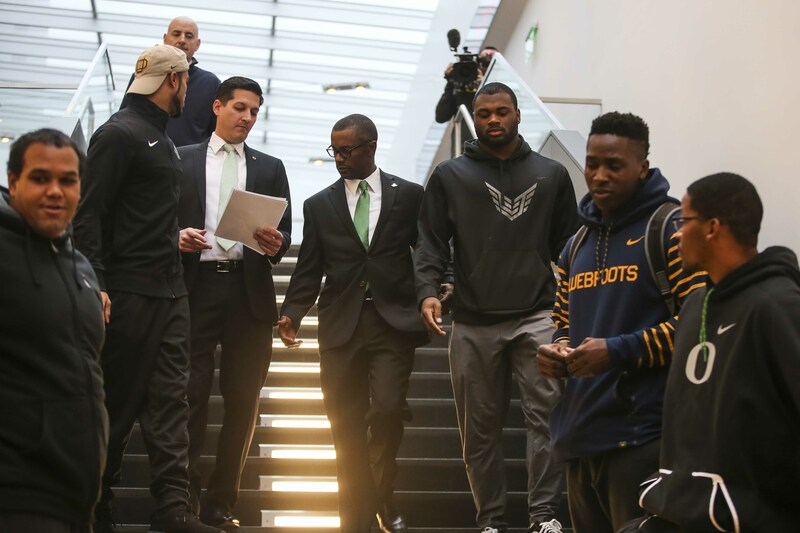 He also expressed pride in how the program has produced many notable student-athletes, including Marcus Mariota, Aaron Wise, Edward Cheserek, Devon Allen, Laura Roesler and Jenna Prandini.